Note: This is not a review. 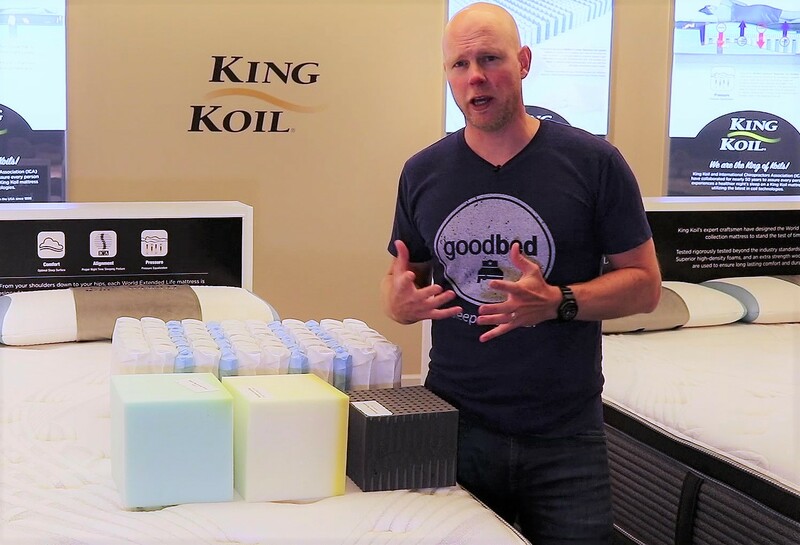 This is our plain-English explanation and overview of the King Koil World Extended Life mattress collection. 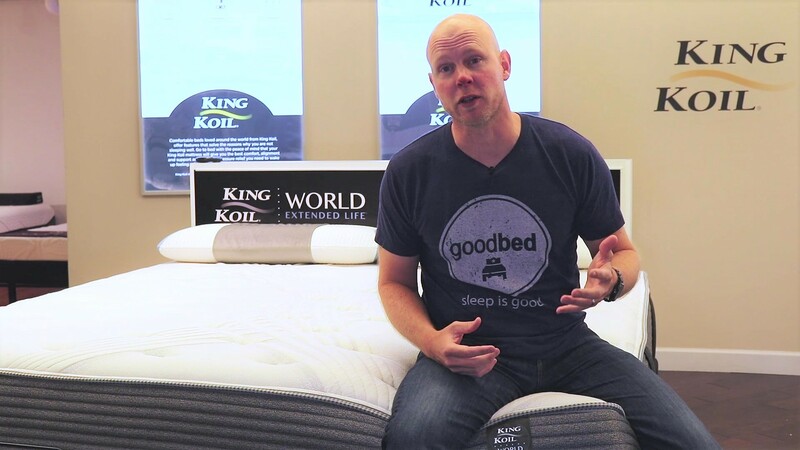 If you’d prefer to watch rather than read, check out our King Koil World Extended Life mattress video. Mattress Height: 14" to 15"
King Koil markets the World Extended Life collection to plus-size individuals and those concerned about body impressions over time. There are four mattresses in the collection, from Extra Firm to a Plush Euro Top, each using the same pocketed coil support unit with varying comfort layers of latex and foam. Note that depending on where the World Extended Life mattresses are sold, you may see these sold as the "Everett" or "Athens." Body impressions -- sagging that can occur over time -- represent one of the biggest customer complaints about all mattresses. A deep body impression can make you feel like you're sleeping in a hole. Mattress companies warrant their mattresses for body impressions, but differ in how deep an impression must be (measured when no one is on the mattress) to trigger a warranty claim. The industry standard for innerspring mattresses is 1.5" deep. King Koil backs up its durability claim by warranting against body impressions of just 1/2" -- the lowest in the industry. That means that even a shallow body impression of one half-inch would be enough to claim a replacement under the warranty. 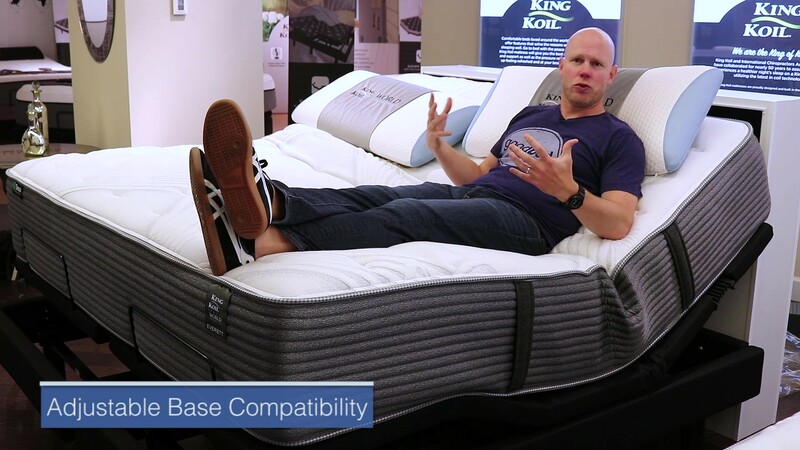 All four of the King Koil Extended Life mattresses share the same pocketed coil support unit, which has some unique features. First, there are two sizes of coils involved. 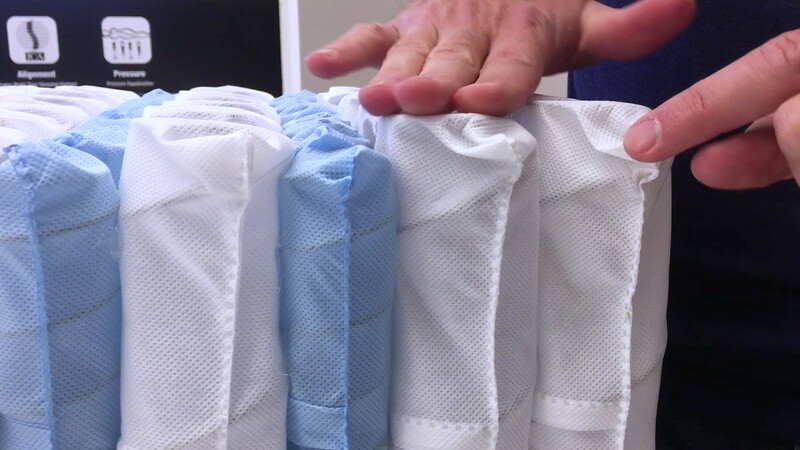 A larger, softer coil (white fabric pocket below) and a smaller coil with more turns and strong gauge wire (the blue fabric pockets below). The two coils are also different heights. As you can see, the softer, larger coils are taller while the smaller, more firm coils are shorter. The net effect is that for lighter people, they may only really engage the larger white-pocketed coils, but the firmer blue pocketed coils are there for heavier individuals, providing support and adding durability. We also think this could be a good solution for couples, where perhaps one person is larger/heavier than the other. Both should experience similar support. Atop of the pocketed coil unit on all versions of the mattress are differing combinations of foam and latex. All four models include a 2" layer of charcoal-infused talalay latex, which is known for durability and pressure relief. Depending on the model, the latex might be on top, or down a layer or two, but all mattresses have it. King Koil also uses standard polyurethane foams in the comfort layers of the mattresses. There are four mattress choices in the King Koil World Extended Life line. Our own assessment of their softness varies slightly from what the company calls them. The extra firm version of the mattress is indeed very firm, in our view. When our 200-pound tester laid on it. he barely sank down at all. Of course, the experience for heavier people will be different; it will feel somewhat softer. The extra firm version, in our view, might be a good choice for stomach sleepers or side sleepers. We found the firm version to be a little softer than the extra firm, and notably more cushioned and conforming. We would call it a firm on our scale as well. Our tester felt very supported on his back, and he sunk down a bit more than with the extra firm version. The plush version of the World Extended Life mattress, in our view, was what we would call medium firm, but again, with progressively more cushioning and conformance than the two firm versions. We thought that most side sleepers would feel good on this version. The euro top version is taller than the other three, and is meant to have deeper cushioning. We thought it was very similar to the plush version, but to a heavier person, it may indeed feel more deeply cushioned and softer. We would still class it a medium firm on our scale. In addition to the already substantial pocketed coil unit, each of the World Extended Life mattresses has a border of foam. 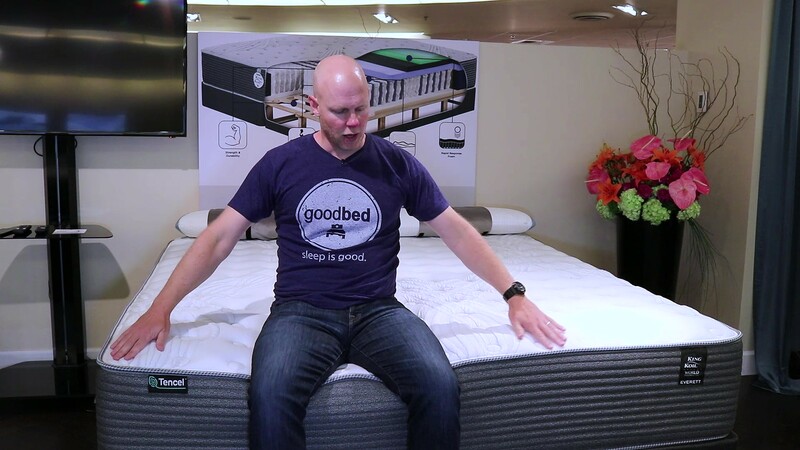 As you can see, the mattress barely dips when our tester sat on the side. 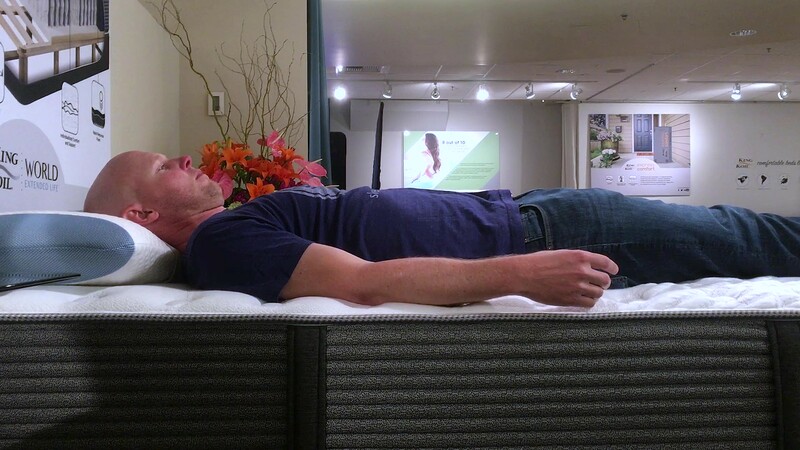 We also tried the King Koil World Extended Life mattress on an adjustable base. You might think that a mattress built like a tank would not bend and flex very well, but we found it to be just fine. Keep in mind that these are MSRPs. Store discounts and specials may be available. Each of these are dependent on where the mattress is purchased, as each store has its own policy. One of the biggest, if not THE biggest complaints about any mattress from consumers regards body impressions—the inability of a mattress to spring back, eventually creating a low spot/sinkhole in the mattress. As such, mattress warranties all contain a term defining how big a sag or ‘body impression’ (measured when no one is on the mattress) is considered a defect, and thus covered under the warranty. The industry standard for innerspring mattresses is 1.5”. King Koil has chosen to cover indentations on the World Extended Life that meet or exceed 1/2”--far below the industry standard. Practically speaking, that means any softening or sagging would need to be at least that deep before the warranty would offer you protection.